Win the ultimate 'Access All Areas' Snow Patrol prize with Belfast Telegraph! 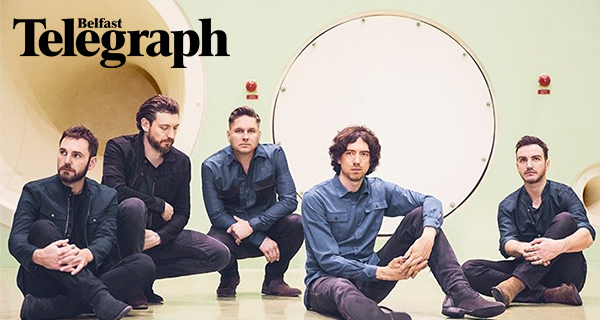 Belfast Telegraph has teamed up with Snow Patrol to offer one lucky winner and a friend the ultimate Snow Patrol prize when the band visit Belfast on their upcoming tour. As well as receiving 2 tickets to the gig on Saturday 8th December at the SSE Arena, our winner and their guest will be taken backstage on an Access All Areas tour and will even meet the band for that all-important photo opportunity! This money-can’t-buy prize is the ultimate fan experience! Snow Patrol’s album Wildness, their first album in seven years, is out now and tickets for their two Belfast shows are on sale from www. Ticketmaster.ie and the SSE Arena Box Office. By entering this competition, you are agreeing to these terms and conditions and consent to your personal data being managed in accordance with our Privacy Statement. 2. If you subscribe to an email newsletter, please note you can unsubscribe at anytime by clicking the unsubscribe link at the bottom of each email newsletter. 3. By entering, all eligible entrants agree to abide by each and all these terms and conditions. The entry form will be part of the overall terms and conditions. Misrepresentative or fraudulent entries will invalidate an entry. Where a competition involves a voting process: offering or receiving any incentive for voting is not permitted and will invalidate the vote, and may disqualify the recipient of the vote. INM NI reserves the right, with or without cause, to exclude entrants and withhold prizes for violating any of these terms and conditions. INM NI reserves the right to amend these terms and conditions. Any amendments will be published on the website. 4. The closing date is midnight on the date included in the additional terms and conditions for online and social media competitions or on the date printed in paper. 5. Promotion is open to residents of Northern Ireland who are over 18 years of age. INM NI reserves the right to request written proof of age from the winner. 6. Employees and agents of INM NI or any company connected with the promotion or any of INM NI’s associated companies are not eligible to take part in the applicable competition, nor are their immediate family members. For these purposes an "immediate family member" includes a spouse, partner, child, step child, grandchild, brother, step brother, sister, step sister, parent, step parent or legal guardian. 7. Each entrant can enter an email address once only. 8. Use of a false email, name or address by an entrant will disqualify them from receiving any prize. 9. The competition winning entry will be selected in a draw by an independent judge. The judge’s decision is final and no correspondence or communication will be entered into. Winner (s) will be contacted by email, telephone or post. 10. In the case of conflict between these rules and such specific directions/terms and conditions, these rules shall prevail. By participating in this competition, you are deemed to accept these rules and the specific directions/terms and conditions applicable to the individual prizes, as specified above. 11. Failure to claim a prize within 7 days will make any claim invalid. Prizes not claimed within the specified time limit will be deemed to have been forfeited and may be disposed of by INM NI without any liability to the winner. 12. No responsibility is accepted for entries damaged, lost or mislaid and proof of posting will not be accepted as proof of delivery. No entries will be accepted by agents, in bulk or from third parties. 13. Winners will be notified within 28 days of the relevant closing date by email, phone or post. Names of winners of major promotions are available by sending an SAE to Independent News & Media NI, 33 Clarendon Road, Belfast, BT1 3BG up to one month after the closing date. 14. INM NI will endeavour to deliver all prizes within 14 days of winning. Where this is not possible the winner will be notified of the delay. 15. Any additional costs and expenses incurred by the prize winner are to be the responsibility of the prize winner. 16. Unless otherwise stated, all taxes, insurances, fees and surcharges are to be the sole responsibility of the prize winner. 17. The determination and decision of INM NI on all matters shall be final and no competition correspondence will be entered into. INM NI reserve the right in their reasonable discretion: (a) to disqualify any claimant, competitor or nominee whose conduct is contrary to the spirit of the rules or the intention of the promotion and to declare as void any or all of their claims or entries based on such conduct; (b) to declare as void any claims or entries resulting from any printing, production and/or distribution errors (including but not limited to any error(s) in the magazine, this website, and/or other printed materials, or where there has been error(s) in any aspect of the preparation for or conduct of the promotion materially affecting the result of the promotion or the number of claimants or the value of claims; (c) to add to or to waive any rules on reasonable notice; and/or (d) to cancel the promotion or any part of it at any stage in the event of circumstances beyond INM NI’s reasonable control. 18. Prizes are non-transferable and may not be re-sold. All prizes, including holiday dates, are subject to availability. If a prize is unavailable due to circumstances out of INM NI’s control, INM NI will take all reasonable steps to substitute the prize with a suitable alternative. No cash alternative will be awarded in lieu of stated prize(s). 19. INM NI accepts no responsibility for the supply, non-supply, purported non-supply or delay in supply of prizes to be provided by a third party including, without limitation, failure of the prize winner to receive ownership of the prize. Prize winners are responsible for booking and/or completing other formalities directly with the specified third party. 20. The promotion may also be declared void should a printing or production error in connection with the competition appear in the magazine or on this website. 21. Entrants acknowledge and accept that publicity may be given to competition winners and winners’ names and images may be published on the Belfast Telegraphwebsite, social media channels and other website(s) relating to the promotion. Winners must co-operate fully for publicity purposes if so required. 22. All entrants agree not to engage in any interviews or make any statements in connection with or arising from the competition without the written consent of INM NI. 23. INM NI reserves the right to publish entries (including parts of entries) other than the winning entry and publication does not necessarily mean the entrant has won a prize. 24. All competition entrants can opt-in to marketing materials or newsletters by ticking the appropriate box(es) on the entry form. Your data will not be used for any marketing purposes without your consent. 25. Personal data collected from this competition will be held securely for 28 days in order to pick a winner. INM NI will delete this data when winners have been chosen and notified.